Cafe Recorder is a simple screen recorder software intended to be used for the creation of timelapse-style videos. Just pick a speed and record. Your video will come out already sped-up and ready to upload to YouTube. If you've ever made a timelapse video on your computer, you know recording the screen is pretty easy nowadays. The bad part is having to edit and render the video into a timelapse. Editing and rendering a 4 hour-long video to shrink it down to 15 minutes can be tedious and frustrating, especially if your computer is not particularly powerful. With this program you can record your desktop at a preset speed multiplier and your video will be ready to upload as soon as you're done recording it. 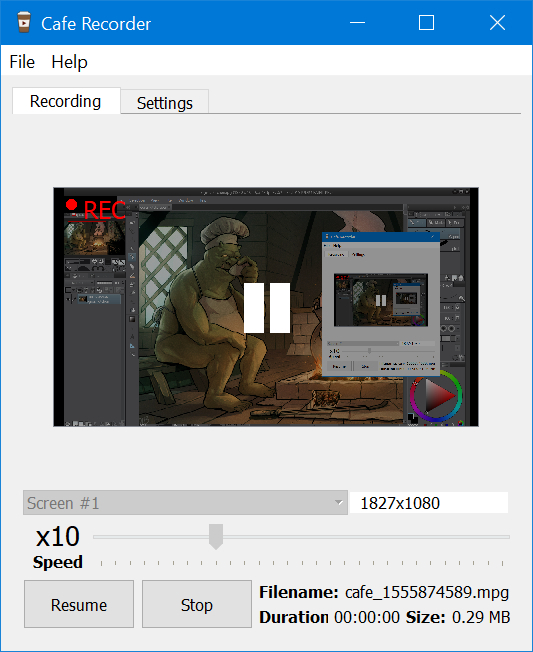 Most other alternatives to record timelapse videos use a screenshot-based system. That still requires you to compile those screenshots into a video, and has the extra downside of being very size-heavy, with hundreds of high quality screenshots weighting down on your hard-drive. this tool instead just records a video and drops a bunch of frames inbetween to achieve the sped-up effect. Simple and lightweight!